In my last installment on the Fahnestocks (a family whose contributions to the architectural legacy of the Gilded Age are often overlooked), I focused on their townhouses. In this post, I will visit some of their country places. Harris Fahnestock and his family summered in the Elberon section of Long Branch, New Jersey in the latter decades of the nineteenth century. While it might not have enjoyed the staying power of some of its peers, after the Civil War the resort’s reputation was on par with Saratoga and Newport, while President Grant declared it the nation’s "Summer Capital" (no less than seven US Presidents would eventually spend time there during the nineteenth and early twentieth centuries). Perhaps more significantly, it was home to many of McKim Mead and White’s earliest commissions, including alterations to the Fahnestock cottage. While I couldn’t find an image of it, it was located next door to President Grant’s on Ocean Avenue. As Long Branch was eclipsed by other resorts, Harris followed fashion and many of his peers, abandoning the Jersey Shore for the rockier environs of Bar Harbor, summering at a cottage there named Steepways in the early twentieth century. By the time Harrison moved up to Maine, several of his offspring had already established their own summer homes. and has been altered almost beyond recognition today. 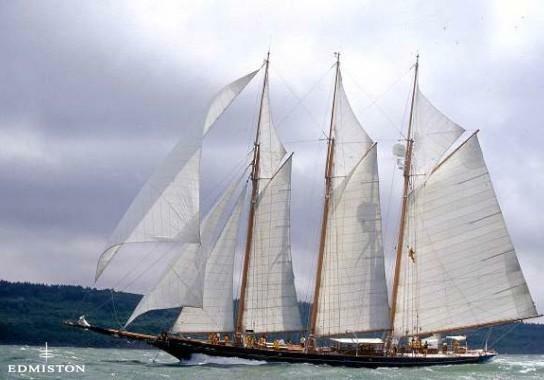 His yacht miraculously still exists looking much as it did when he owned it, plying the waters as a charter vessel. By 1905 daughter Helen (then married to Dr Clarence G Campbell), had amassed a large estate near Cold Spring on Hudson named Glen Eilidh. Tapping into the heritage of the Hudson Highlands, the Campbells had their house built in a Dutch Revival style. While its stepped gables and silhouette blended in poetically with the history of its surroundings, a 17th-century Dutch burgher would hardly recognize the mansion’s massive scale. 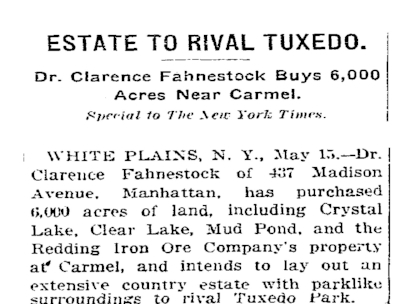 A decade later, The New York Times announced the purchase of 6,000 acres near Helen’s estate by her brother Dr. Clarence Fahnestock in May 1915. Consisting of former farms, several lakes, and property owned by an iron ore company, the Times went on to state he intended to build a mansion there and “lay out an estate with parklike surroundings to rival Tuxedo Park.” His dream was never realized. He volunteered to serve in France during World War I, and died there in 1918. His family donated much of his property to New York State, forming the nucleus of what is today the Clarence Fahnestock State Park. Brother Dr. Ernest Fahnestock chose a more familiar locale, not far from the family’s’ former summer residence in Long Branch, when he purchased a 115 -acre farm in Shrewsbury New Jersey in 1908. A 25-room Georgian Colonial Revival mansion and farm complex designed by Albro and Lindberg rose on the property within two years. The cost for the mansion alone was said to have been $200,000, and over the years it was estimated Ernest and his family lavished over $1million on buildings, embellishing the grounds and acquiring additional acreage, transforming the farm into a model agricultural estate so beloved by the gilded age elite. Ernest’s widow kept the property for several years after his death in 1937 before selling it to commercial interests. While Helen and Ernest favored colonial antecedents, their brother Harris Jr looked straight to England for inspiration when it cam time to build his country home in Lenox. Hoppin and Koen designed a hipped-roof red brick mansion for him named Eastover, that was both suitably grand and comfortable at the time. So happy was he with the results that he tapped the firm to design his new Manhattan townhouse several years later. The property was auctioned off in 1941 shortly after Harris’ death. Going through several incarnations, today it serves as a holistic retreat center. 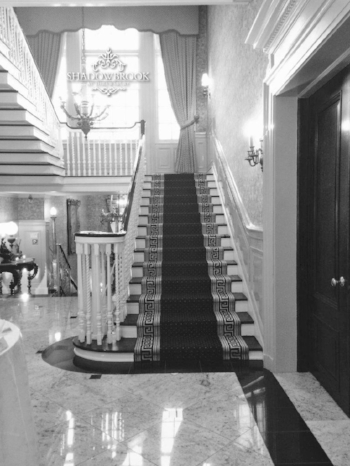 While altered to accommodate its current use, like Shadowbrook it still retains some of its gilded age elegance. That leaves William Fahnestock as the last but certainly not least of the siblings, who had not one but two significant places outside the city. The first was his farm Girdle Ridge in Katonah. 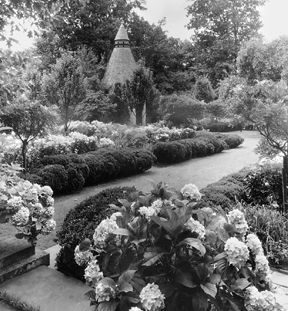 William tapped Charles Platt to design a soigné neoclassical mansion on his estate while Ellen Biddle Shipman designed the noteworthy gardens there. Unfortunately, the home and property are no longer extant. More fortunately, his Newport cottage Bois Dore, a French-inspired, symmetrical mansion also designed for him by Platt in 1927 still stands. After Williams death, it was purchased by the Dorrance family (of the Campbell soup fortune) who carried on the Fahnestock's tradition of grand entertaining and later by Caroline Skelly Burford, the oil heiress and victim of several notable jewel heists (real and perhaps imagined), causing her later to proclaim she had “ lost more carats than Bugs Bunny”. It is still a private residence, its ballroom still the scene of grand entertainments. While many of the siblings’ homes left the family and residential use (Bois Doré excepted) by the 1940s, that did not mean the following generation of the family were slouches by any means when it came to country homes. Gibson's son Snowden Fahnestock had a cottage constructed for him in Newport on Harrison Avenue in 1932. Named Ker Arvor, it was inspired by the Chateau La Lanterne at Versailles. It remains a private home, currently on the market for a cool $12 million. 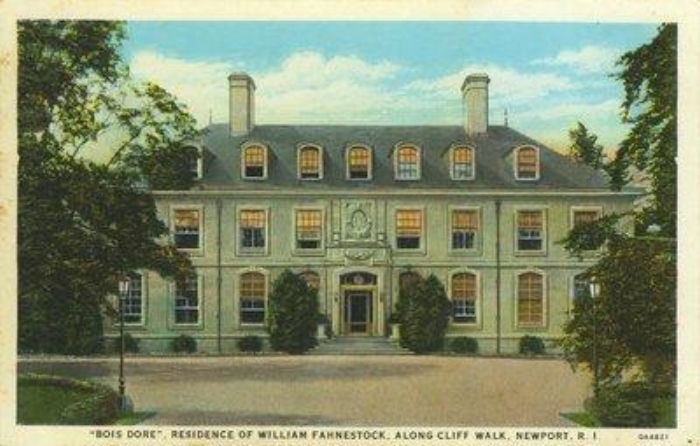 William’s son William Fahnestock Jr bought a historic estate in Maryland named Readbourne. In the 1940s he sensitively enlarged the 1790’s main house, adding a wing to balanced an existing one and eventually enlarging the estate to 975 acres. Readbourne remains a private residence, (recently on the market for $15,100,000).